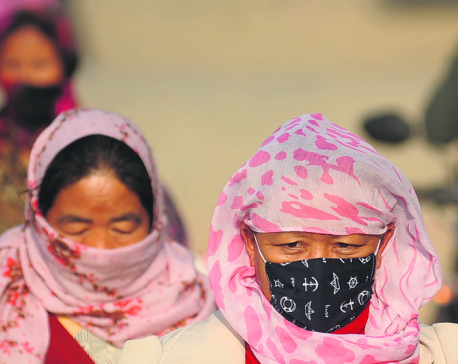 KATHMANDU, March 27: Case 1: Five hundred students from nursery to grade three at Bright Future Secondary School at Naikap on the outskirts of Kathmandu have to inhale dust and fumes from vehicle emission and put up with the noise of vehicles. The school is adjacent to the Kalanki-Nagdhunga road section, which serves as the exit from the capital for a majority of vehicles headed for the Prithvi Highway. The seniors wing of the school with about 800 students is just 50 meters from the busy road. Case 2: Rooms, tables and chairs at Prime English School at Naikap in Chandragiri Municipality, where 400 students including toddlers are enrolled, become covered with layers of dust every two hours. Case 3: Padmodaya Secondary School, which has 1,000 students and is located at a crossroads at Putalisadak in Kathmandu, is helpless against the heavy smoke and dust and vehicle noise. Case 4: Sundarban School at Naikap, Siddheshwor School at Shantinagar, Kanya School at Dillibazaar and Durbar High School at Ranipokhari are among dozens of other schools located at busy, noisy and polluted roadsides. A majority of the 2,000 schools in Kathmandu Valley are running alongside the roads, without any consideration of the harmful effects of the pollution on the thousands of school children. The existing rules include provisions for a healthy atmosphere and greenery at schools as well as on restrictions on the sale of alcohol and tobacco products in the school vicinities. However, these rules have remained confined to paper. The school authorities themselves are either unaware of the rules or do not like to talk about whether the environmental rights of students were considered while establishing the schools or constructing the school buildings. “The rules may be there but I don't know about them in detail,” said Balkrishna Bhetwal, principal of Prime English School at Naikap. Manju Shrestha, coordinator of the pre-primary section at Bright Future Secondary School at Naikap, said that students at her school, which was opened in 1987 near the roadside, are used to the pollution. 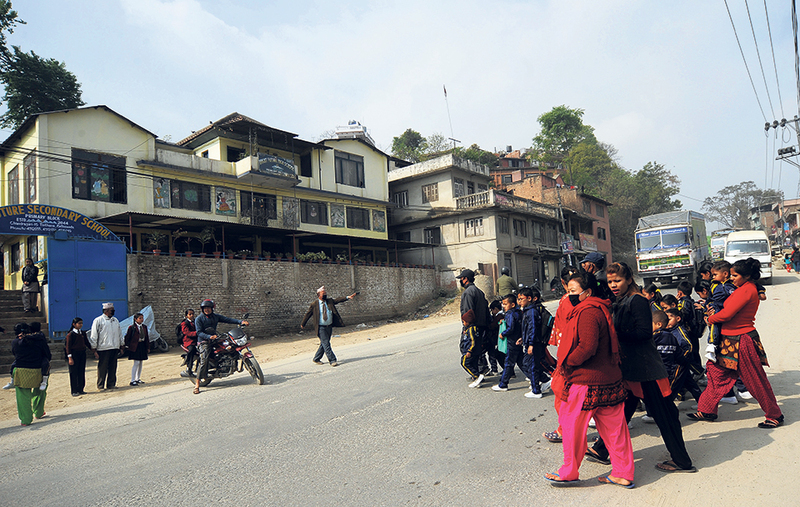 “The school can't be shifted to some other place,” said Shrestha. “We have only noticed itching and allergic reactions among the students sometimes,” she added. “The government should be thinking about doing something about the road pollution,” she added. Pediatrician Dr Krishna Paudel informed that the impact of such pollution on children could be critical in both the short and long terms. “Pollution is a serious threat to respiratory functions, skin health and children's ability to concentrate,” said Dr Paudel. “Smoke and dust can damage the lungs as well as affect blood circulation,” he added. “Noise pollution can harm one's hearing and also trigger psychological and neurological problems.” There has been no study yet on the impact of pollution on school children in Nepal. The air in Kathmandu Valley is contaminated with toxins like sulphate, ammonia, nitrate, carbon mono-oxide, lead and carbon particles, which can account for 72 percent of the risk for cardiovascular disease and stroke, 14 percent for lung damage and 14 percent for cancer, according to experts. Air pollution along the busy intersections is eight times higher than the national standard, which itself is twice the international standard, according to Nepal Health Research Council (NHRC). Normal noise levels inside a room are measured at 60 decibels (dB) and more than 85dB experienced continuously can harm an individual's health. Eight hours of exposure to 90dB noise can cause hearing damage, said ENT specialist Dr Yogesh Neupane of NHRC. At 100dB, the damage can occur with just 15 minutes of exposure while exposure to 140dB can cause immediate nerve damage, according to the World Health Organization (WHO). Studies have shown that the noise levels outside the cabins of buses and trucks would be around 115dB. Residential houses and schools should be at least 660 feet away from roads to be safe from noise pollution while the safe distance from vehicle emission with high toxicity would be between 330 to 500 feet and from elevated toxicity level between 1,000 feet to 1,500 feet, according to a study carried out in the USA. 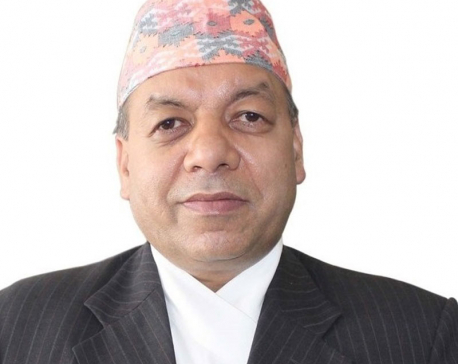 Nepal has not formulated any specific rules to protect school children from the harmful impact of pollution, said high ranking government officials. “This is a very serious issue concerning children's health,” they added.